Let me tell you about resistor color code and how it works. We often look at a lot of resistors in many electronic circuits. Do you know how to use it? How it works. I think it is a very important electronic device. If you do not have them. Your project may not work. The resistor is an electronics component. Meet Resistors in the image below. It looks like a beautiful worm. With 2 legs on the head and end of the body. The 1/4 watts resistor is my most used shape. It will resist or limit the current flowing it. The levels or size that they are resisting. We call the resistance. If more resistance, less current flows in the circuit. You may not imagine. The current looks like the water in a pipe, below. 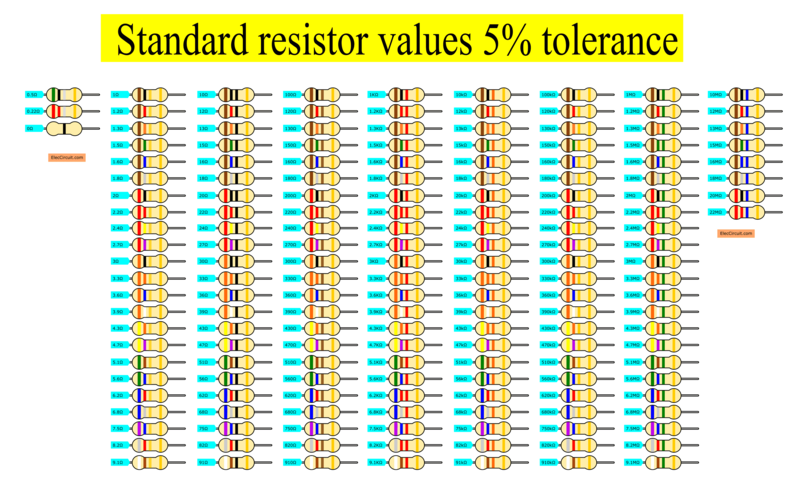 The left resistor has high resistance. So the current can flow is low. But on the other hand, the right has low resistance inside. So the current can flow through it higher. Using the resistor in a series circuit. They are very useful for reducing the current to the LED. Which it can damage with too much current. Most using resistors to divide a voltage into a smaller voltage. Resistors are used to increase the time required to charge capacitors and speed up the discharged of capacitors. They are also used to control the gain of amplifiers. When my son learns about basic Electronics. He should learn about the resistors first. How does it shape? He said they look like a worm. Learn to use the meter to measure its value. Now, I have not taught him to read the color code. Because it is too difficult for him. He uses a digital ohmmeter to measure the resistors. It is so easy to read the resistance of the resistors. Then, he learns about basic of resistor, name, symbol and Its value in decimal units. Using a digital multimeter to measure the resistors or how to use ohms meter. He has not understood the math (decimal point). But it is important in Electronics. He can understand in the future. When we look at the resistor. We will notice many color bands on it. These colors show their resistance. We can measure them in ohms. When we write it, we can write an omega symbol, Ω. 1Ω is quite small so resistor values are often given in kΩ and MΩ. Why use color codes? As the resistors are small components. We can difficult to see resistor values on them. So, these resistors have the color-coded instead. To begin with, you look at the block diagram below. Now, most resistors have 4 color bands. When I was a young boy. I used to see the three color bands in AM receiver radio. Suppose we have a resistor color code, brown, black, red and gold. How many its resistance? Secondly, start to look the color band left to right. The first is the first digit of resistance. We know the first band is “1” in resistance. Then, the second band is the second digit. It is black for “0”. Now, we have the resistance is 10. Look at the third color band is red. The multiplier is 100Ω. The fourth color band means an actual resistance, tolerance. It is gold, so its tolerance of ±5 percent, 25Ω. Thus in real using its resistance is between 950Ω and 1050Ω. Which if you see the resistors having the tolerance resistance 10%(silver). You can get it is the same this how. Look at the resistor again. You will notice two group color. First, tolerance is one band only, often for gold. Second, three bands are the resistance value. My son does not like to use how above. He finds an easier way. We can decode the resistor color without having to calculate with this table. You may do not understand how to use it. When more use more understand! For example, You have 6 resistors. All last color band is Glod. So, it is 5% tolerance. What is each resistance? 1. The first resistor,—Brown, Black, Red, and Gold. First, Brown and Black are 10. Second, look at the third color band is red. We put a dot between the first color and second color band. It is 1.0. Then we put a kΩ as its unit. Now we have 1.0kΩ or 1kΩ. 2. The second resistor,—Yellow, Purple, Red, and Gold. First, yellow and purple are 47. Then, we put the dot between the first and second color. It is 4.7. Next, we put the kΩ. So its resistance is 4.7kΩ. 3. Third resistor,—Orange, Orange, Orange, Gold. First, yellow and purple are 33. Then, we put a kΩ at behind the second color as the unit. So its resistance is 33kΩ. 4. Fourth resistor,—Red, Red, Yellow, Gold. First, Red and Red are 22. Then, we put 0 (zero) behind the second color. It is 220. Next, put a kΩ at behind the zero as the unit. So its resistance is 220kΩ. 5. Fifth resistor,—Brown, Black, Gold, Gold. First, Brown and Black are 10. When the third color band is the Gold, we put the dot between the first color and second color band. It is 1.0 and the unit is Ω. So, the resistance is 1.0Ω or 1Ω. 6. Sixth resistor,—Green, Black, Silver, and Gold. First, Green and Black are 50. When the third color band is the Silver, we put the dot font the first color band. It is 0.50 and the unit is Ω. So, the resistance is 0.50Ω or 0.5Ω. OR you can look list color code on each resistor here. I am always happy. When the elderly said Interested in learning electronics. It makes our lives useful. Time passed quickly and everyone enjoyed. Also, the children liked it. I will dedicate to writing the easiest readable articles. It is good teaching! so easy to learn. Keep your job!